Last week saw a lot of network TV shows being eliminated to make way for new content next season, and among the casualties was ABC’s Agent Carter. After two seasons of Peggy Carter’s spy adventures in the 1940s, the show was cancelled due to low viewership and ratings. Well, Agent Carter fans aren’t taking this sitting down, and now they’re taking steps to try to get the series to return for Season 3 on Netflix. Not long after the cancellation was made official, a petition appeared on Change.org to move Agent Carter to Netflix, citing that was a show “who united a lot of people.” As of this writing, it has gathered over 57,000 supporters, and it needs to reach 75,000 to hit its next goal. The online streaming platform is notable for its lineup of successful Marvel programming, which so far consists of Daredevil and Jessica Jones, but will also include Luke Cage, Iron Fist, The Defenders miniseries and The Punisher. In addition to the signatures, the petition has also received support from may people involved with Agent Carter, including Bridget Regan, who plays Peggy’s nemesis Dottie Underwood, and Chad Michael Murray, who plays agent Jack Thompson. 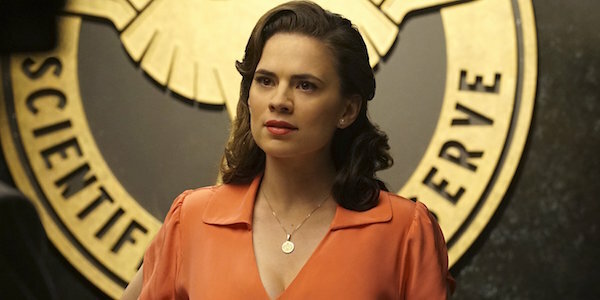 Over its two short seasons (it aired in Agents of S.H.I.E.L.D.’s timeslot while that series was on hiatus), Agent Carter followed Peggy Carter's spy exploits after losing Steve Rogers in Captain America: The First Avenger, but before she became one of the founding members of S.H.I.E.L.D. This past season took her to Los Angeles, where she clashed against genius Whitney Frost. Season 2 ended on a few cliffhangers, so from a storytelling standpoint, there’s certainly more material for the show to cover. Although not a regular occurrence, the past few years have seen certain shows moved from a regular network to an online platform (like The Mindy Project going from Fox to Hulu). So even though this petition isn’t a guarantee for “rebirth,” Agent Carter does stand a better chance than most shows, especially given Marvel’s successful partnership with Netflix. Along with Agent Carter’s cancellation, last Thursday also brought the news that Hayley Atwell’s pilot, Conviction, had been picked up on ABC. Assuming Conviction does well, that will take up a lot of Atwell’s time, meaning that it may be a while before there’s room in the actress’ schedule for Agent Carter Season 3. Fortunately, Atwell has said many times how much Peggy Carter means to her, so she’d likely find the time to fit in reprising the beloved spy. Assuming this petition is successful, that might just guarantee the show wraps up with Season 3, but if there’s positive response to it on Netflix and if Atwell and the supporting cast can make it work with their other projects, it’s possible it could return for future seasons. Of course, if you watch the Marvel movies, you know that Peggy Carter goes on to live a long and adventurous life, so it’s not like her fate is a secret. Fans would just like a few more of the gaps filled in. Let us know what you think about seeing Agent Carter Season 3 in the comments below.